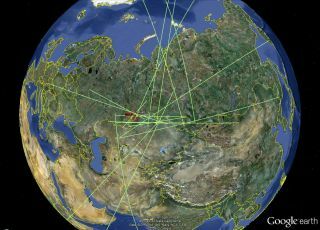 Seventeen infrasound stations in the Comprehensive Nuclear-Test-Ban Treaty Organization's network detected the infrasonic waves from the meteor that broke-up over Russia’s Ural mountains on Feb. 15, 2013. A far-flung system of detectors that make up a Comprehensive Nuclear-Test-Ban Treaty network made its largest ever detection when a meteor exploded over Russia’s Ural mountains last week. The Vienna, Austria-based Comprehensive Nuclear-Test-Ban Treaty Organization (CTBTO) runs the International Monitoring System made up of infrasound stations. Infrasound is low frequency sound with a range of less than 10 Hertz. Humans cannot hear the low frequency waves that were emitted by the meteor blast over Russia on Friday (Feb. 15), but they were recorded by the CTBTO’s network of sensors as they travelled across continents. When the space rock detonated, the blast was detected by 17 infrasound stations in the CTBTO’s network that track atomic blasts across Earth. The furthest station to record the sub-audible sound was some 9,320 miles (15,000 kilometers) away in Antarctica. A Comprehensive Nuclear-Test-Ban Treaty Organization Infrasound station IS21, Marquesas Islands, France. In a CTBTO statement discussing the Russian bolide, Pierrick Mialle, an acoustic scientist for the group said: "We saw straight away that the event would be huge, in the same order as the Sulawesi event from 2009. The observations are some of the largest that CTBTO's infrasound stations have detected." The Russian meteor blast picked up by the detectors is not a single explosion, Mialle said. Rather, it is burning, traveling faster than the speed of sound. "That's how we distinguish it from mining blasts or volcanic eruptions," he said. Mialle said that scientists around the world will be using the CTBTO's data to better gauge the object's breakup and discern more about the object's final altitude, energy released and how the meteor disintegrated. Visual representation of the infrasound waves and computer attributes by the Comprehensive Nuclear-Test-Ban Treaty Organization’s (CTBTO) International Data Center, made from fireball data recorded by a CTBTO station in Kazakhstan. This graphic depicts the sources of infrasound signals that can be detected by the Comprehensive Nuclear-Test-Ban Treaty Organization's listening stations. There are currently 45 infrasound stations in the CTBTO's network that measure micropressure changes in the atmosphere generated by infrasonic waves. Infrasound is one of the technologies used in the CTBTO’s network of sensors to monitor the globe for violations of the Comprehensive Nuclear-Test-Ban Treaty that bans all nuclear explosions. Infrasound has been used as part of the CTBTO's tools to detect atomic blasts since April 2001 when the first station came online in Germany. Data from the stations is sent in near real time to Vienna, Austria, for analysis at the CTBTO’s headquarters. Both the raw and analyzed data are provided to all Member States of the CTBTO. Just days before the meteor explosion over Russia, the CTBTO's seismic network detected a seismic event in North Korea. That event on Feb. 12 measured 4.9 in magnitude. Later that morning, North Korean officials announced that the country had conducted a nuclear test. The event was registered by 94 seismic stations and two infrasound stations in the CTBTO's network.